We have closed the show on 8 days of fun and meeting so many new people, putting faces to our online customers. So here’s my wrap on the show. 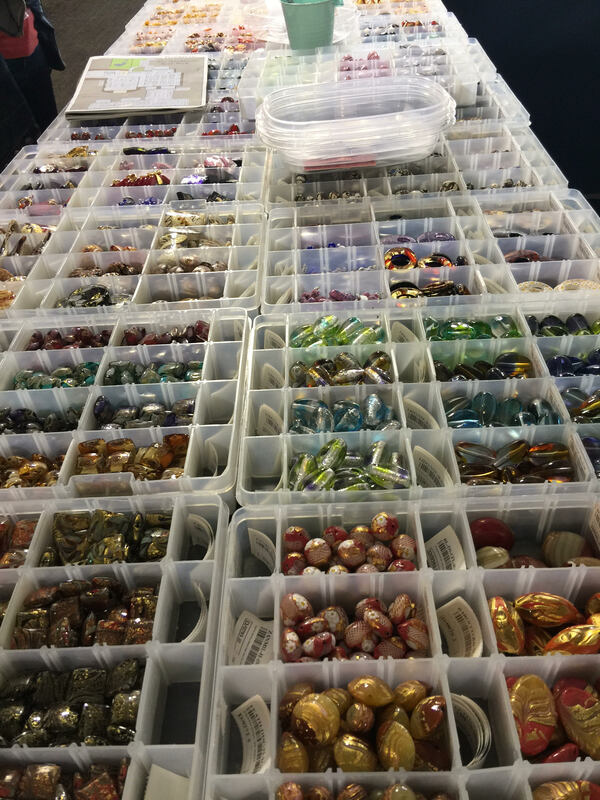 The preparations start immediately after the Christmas rush and trays of beads must be prepared, filled and labeled correctly (we hope). We operate on a bar code system so making sure that technology is on spot is essential. We’ve always thought it was important for our customers to know what they bought, what they paid and more significantly, how to re-order it. In my days before exhibiting at the shows, I always found it exasperating that I got home with a piece of paper with scribbles on it and couldn’t identify a single bead back to it’s price. Technology has not kept up in any exhibiting arena we’ve ever worked. There is always the frantic attempt to get the internet, the wifi, the card processing up and running. It is enough to give you a case of hyper ventilation! So Checklist: Barcodes working, Paypal Here working. Nothing lost on the 12 hour trip from the San Francisco bay area to Tucson, just a little sleep and a sore back from sitting in the van. A few pictures of the trip down and us getting set up. The Cactus and view are amazing! Our neighbors in the show are familiar faces despite our hiatus from Tucson. 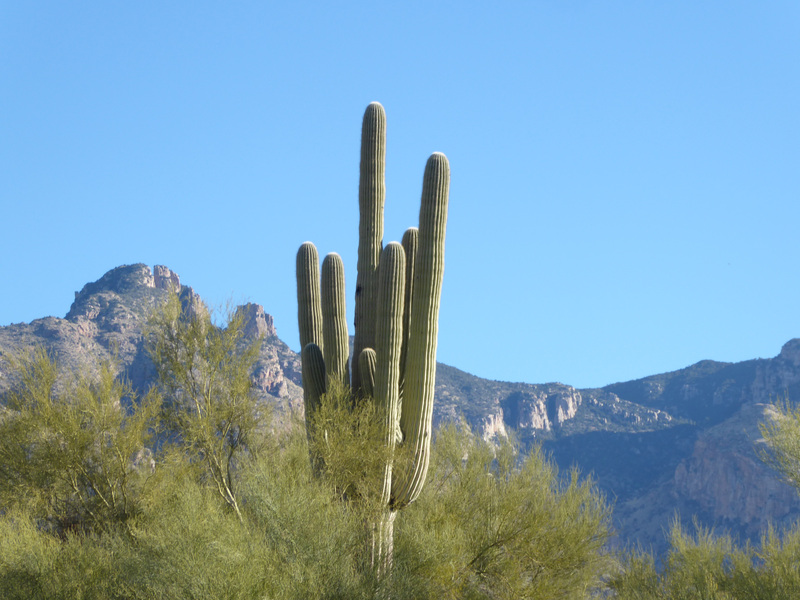 We love the area, and each morning heading to the show I detour so I can catch a glimpse of those amazing sagauro cactus. I even drive a detour (a long cut) getting to Tucson which takes me through a desert land of these armed monsters. Ageless, they don’t even get their arms until they approach 75-100 years. They are native to the Sonoran Desert in Arizona, the Mexican State of Sonora, and the Whipple Mountains and Imperial County areas of California. They can grow to 70 feet tall and are home to dozens of desert critters. 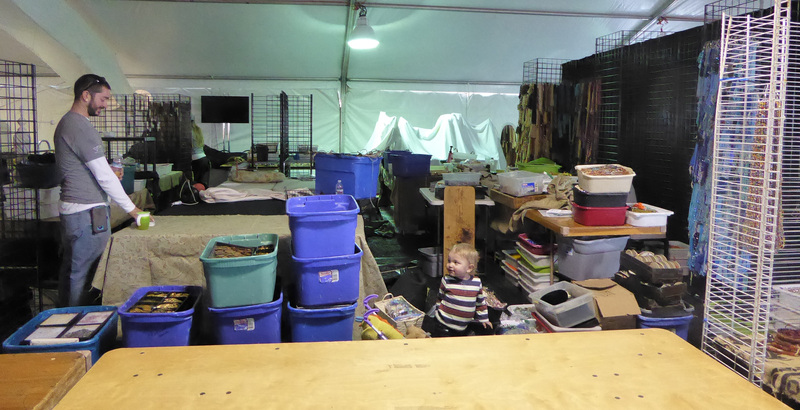 Our Neighbors at the show, That’s Carter – Experienced Show Vendor at 15 months. When we arrive we have tables and nothing else. 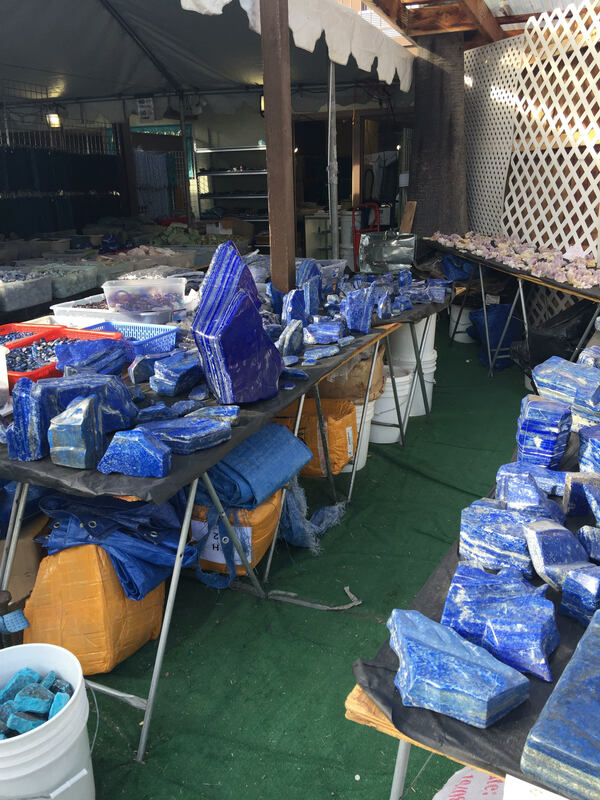 About 6 hours later, we have everything unpacked and ready for our customers. Well setup went perfectly until we got to the hotel. A slip on the pebbles used everywhere in place of grass sent me tumbling. A quick assessment of working parts, I decided the arm was not working. It was about 8 pm and the show opened at 10 the following morning. 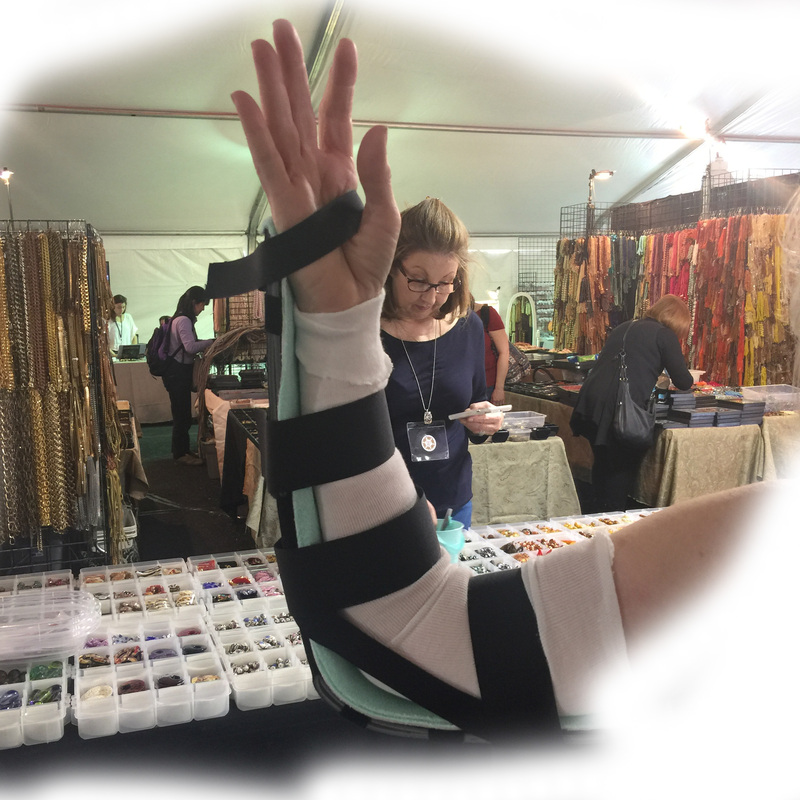 Plenty of time for a visit to the Emergency Room where 6 hours later I emerged with a cast large enough to make sure I couldn’t move, but still able to man the booth and didn’t impair my talking ;>) It did, however, require me cutting the right sleeve of my tops. Thanks so much to Janice a long time Tucson customer for helping us…we were a little short-handed (pun intended)! 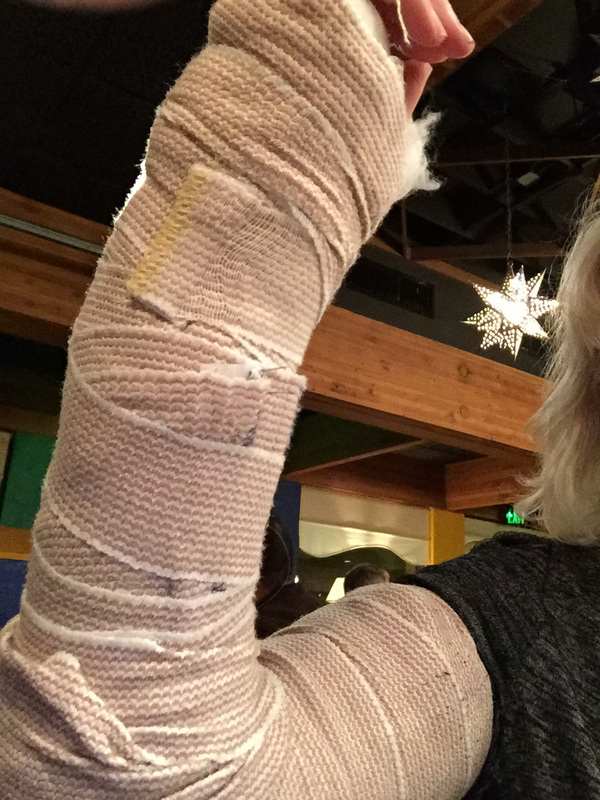 By the end of the show I get a new streamlined cast and have a new respect for using my left hand. We got up super early to visit some of the rock and fossil shows. 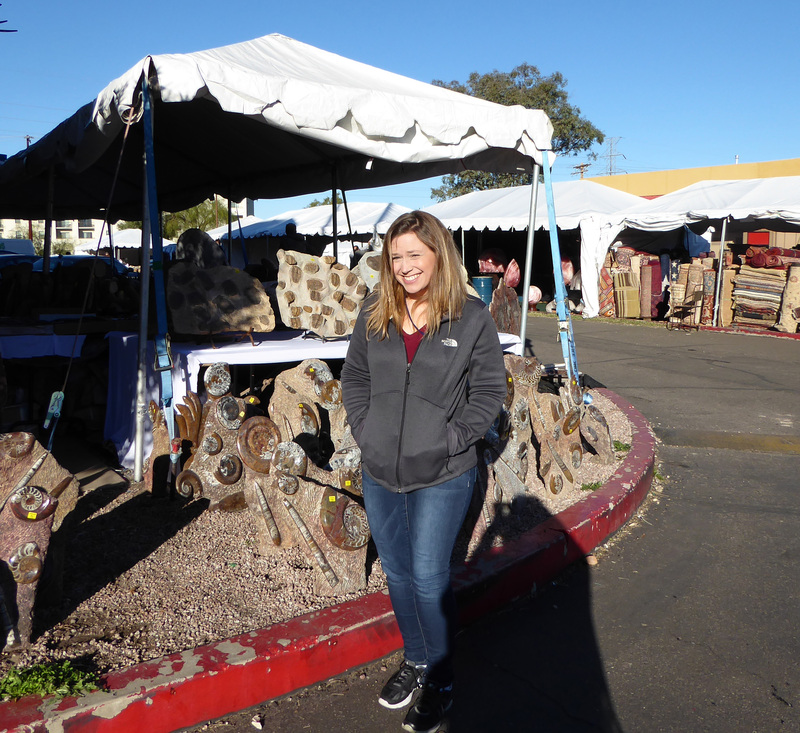 It is worth a trip just to see the staggering amount of goods shipped from around the world. Rock Hounds – put this on your list! 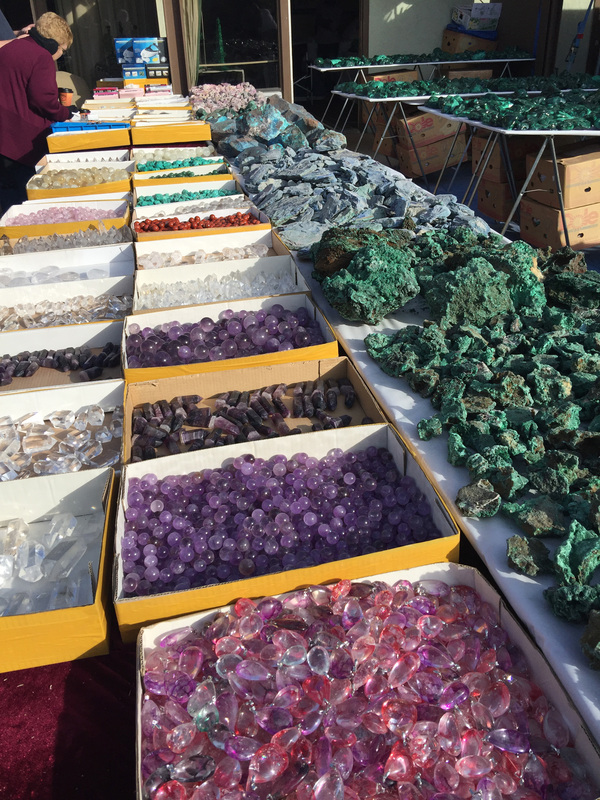 Tons of Malachite, Amethyst, Lamar, Hematite, Obsidian, Quartz, Opals, Pearls by the kilo – it is all here. 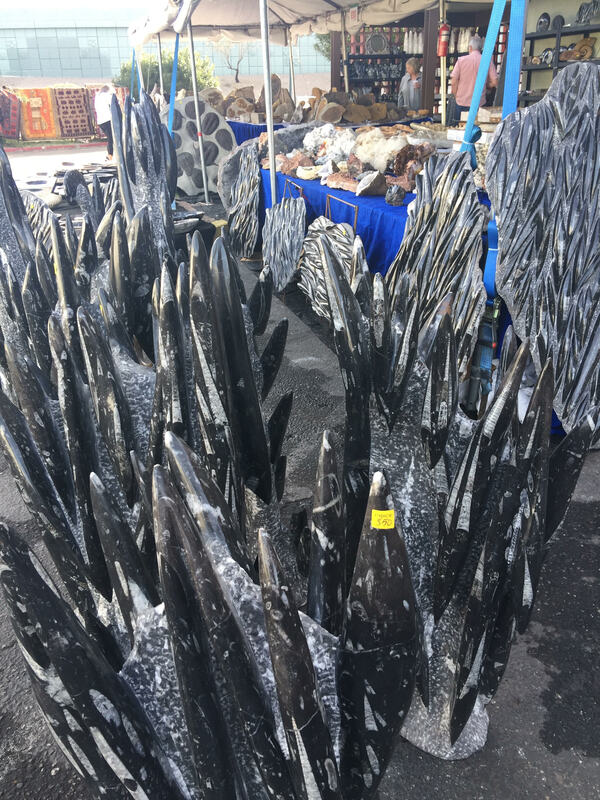 Every stone under the sun!!!! 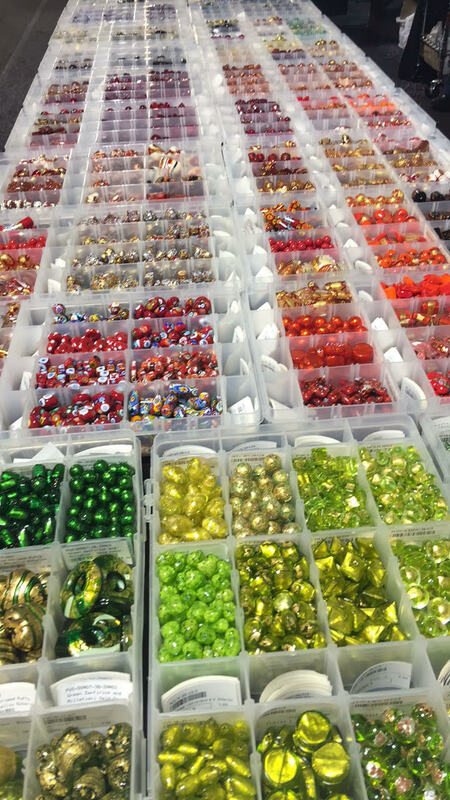 It is impossible for us to take all our bead styles/colors. 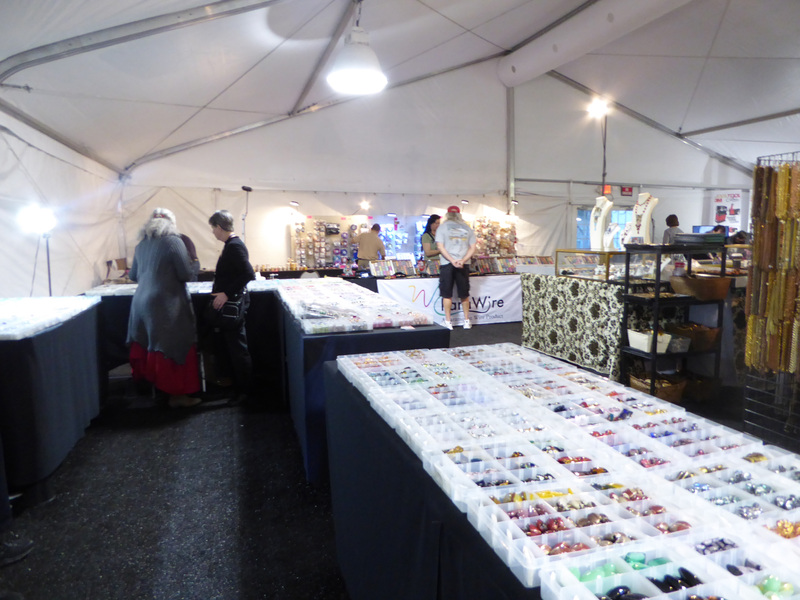 But we did take about 1200 different beads. Here are a couple of pictures of our bead trays, all bar-coded. We are looking at the ToBeadTrueBlue show dates for Tucson 2018, but we have to double check the Carnevale Venezia dates – have to do the important things. It is overwhelming. We never have time to visit all of the shows, so it’s still on our to do list as well. I could be converted into a rock hound easily!